Titan Factory Direct has retail locations in Louisiana, Georgia, Florida, Virginia and North Carolina. 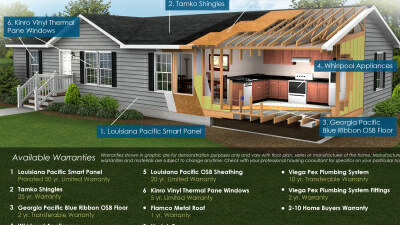 Every manufactured home Titan Factory Direct sells is professionally designed and engineered. Our homes are built by carpenters and skilled tradesmen to meet the proper building code – whether it is the national, state or local code. Constructed indoors in a controlled factory environment, our manufactured and modular homes are inspected at every phase of the home construction process, ensuring high quality standards are met. 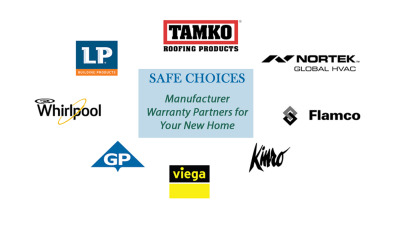 Our homes include some of the most trusted and recognized brands in the industry such as Whirlpool®, Daltile®, Broan®, Owens Corning® and Georgia-Pacific®. 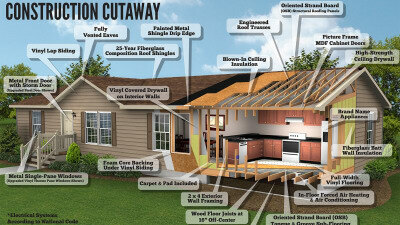 These building material suppliers, along with many others, share our dedication to quality in home construction. Call or visit the location that is closest to you to see display models and speak with housing specialists for more information about our modular homes and the many services that we offer. Don't wait, get started finding your new home today! See a cutaway view of the high quality materials and standard features that make up a Champion home at Titan Factory Direct. New mobile homes from Titan Factory Direct include manufacturer warranties from some of the most trusted brands in the industry. Titan partners with the top manufacturers to offer the best new home warranties on the market.